As ephemeral artistic practices that engage the performer’s body in the presence of an audience, performance art and contemporary dance call upon modes of transmission emerging at once from the archive and from oral and corporeal memory. 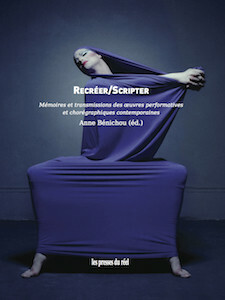 Essays by: Clarisse Bardiot, Anne Bénichou, Yves Bergeron, Marc Boivin, Elsa Bourdot, Ginelle Chagnon, Mario Côté, The Two Gullivers (Flutura Preka et Besnik Haxhillari), Amélie Giguère, Amelia Jones, Isabelle Launay, Catherine Lavoie-Marcus, André Lepecki, Babette Mangolte, Sylvie Mokhtari, Jacques Perron, Isabelle Poirier, Céline Roux, Theresa Rowat, Michèle Rust, Jessica Santone, Noémie Solomon, Ming Tiampo. This book is the result of Documenter, recréer… three days of reflection that were held in Montreal from May 2nd to 4th, 2013, through the Fondation Jean-Pierre Perreault and the Institut du patrimoine de l’Université du Québec à Montréal. The event began with Anne Bénichou’s overview of this anthology containing writings that explore the revivals made possible through the archive. A huge thank you to Anne for this publication that now leaves us with lasting documentation of Documenter, recréer… three days of reflection that were held in Montreal from May 2nd to 4th, 2013 through the FJPP in collaboration with the Institut du patrimoine de l’UQAM. All our copies were sold during the launch, but you can still purchase the book through Presses du réel or at Formats bookstore.